Inspired by the Japanese idiom "Ichigo Ichie," which is often interpreted as "for this time only," Maisadou successfully integrates tea-making and the Zen concept of transience, while insisting that a delicious brew can only be produced with fine-quality water and a flawless brewing method. 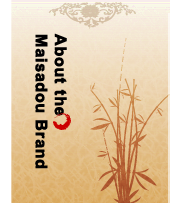 As the quality of tea leaves determines whether a beverage brings out the excellence in the ingredients, Maisadou prepares teas free of artificial flavoring, by selecting premium tea varieties. Beverages are made according to ingenious recipes based on freshly squeezed juice and imported ingredients (coffee beans, fruit syrups and Matcha tea), while Nescafe coffee creamer, Linfengying High-Quality Pasteurized Milk and Pudding, Yakult and Duroyal Ice Cream are used as additional ingredients, along with the 3M CUNO drinking water-filtration system of the same standard as McDonald's kitchens. Maisadou pays relentless attention to every detail of the tea-preparing process as it believes that only those undaunted by the onerous steps are able to professionally deliver an extraordinary style of beverages to all customers. As the brand name suggests, Maisadou is the tea retailing industry's equivalent of Omotesando Avenue, a fashion-forward street in Tokyo. From selecting, preparing and baking tea leaves, to brewing, every step of the tea-preparing process is executed with professionalism and attentiveness to underscore the excellent flavor in the finished brew. As the tea leaves visibly unfold in each crystal-clear cup of Maisadou beverage, changing shape gracefully and slowly as if they were dancing, the brand proves its determination to sell 100% freshly brewed tea that epitomizes the way of Zen! Striding forward on the Omotesando Avenue as the provider of excellent teas, Maisadou not only interprets the Japanese chic with a modern twist, but also offers customers a splendid first encounter with the tradition of tea ceremony.